Thanks so much for giving me the inspiration to play with my scarves, in particular, the pochette/gavroche. I have always like them to hang on my handbag, and now with your small scarf ring, and the fur collars, they have found a new occupation! It occurred to me that I could extend their usefulness even more by combining them. I had two in the same pattern, Brazil, and that was my start. I then tried matching colorways and those two were...... Another combo was just picking out a color from one and trying it with another pattern. Trial and error all the way. 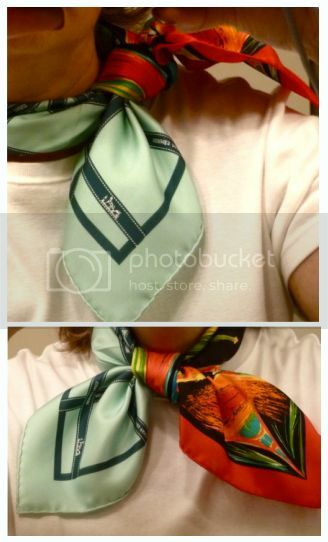 How-to: Fold two Gavroches in the basic bias fold, and tie them together at one end with a small knot or scarf ring. From there, experiment with different knots and ways to tie. Ooh, I love this idea!! Very well executed too. I agree with you on both points, Deja Pseu. Here's to GK! It is a fabulous idea! Thanks for sharing! Great idea gracekelly & MaiTai! I assume the 2 gavroches are joined with the petite scarf ring at the back? Just when I was wishing Hermes would make their gavroches bigger at say 18" like DKNY - this idea solves the problem :-)thank you! Lovely idea - the only question is how? Because of course that is one of the things I love most about your ideas is that you illustrate exactly how to execute them. This is begging for a video! Thank you dear MaiTai!! You have made a beautiful presentation. Hope everyone enjoys the viewing! 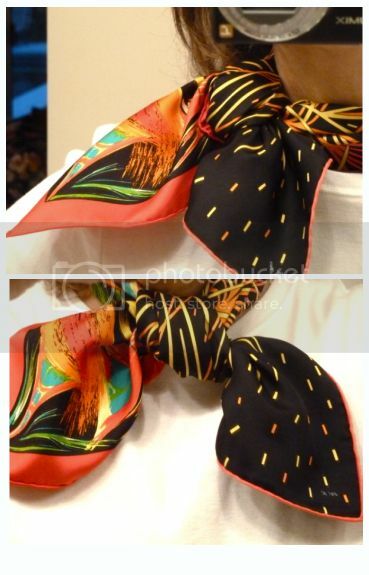 To answer Scarf Addict, you can just tie them together in a small knot or use the scarf ring. Whatever you would like. What a great idea! 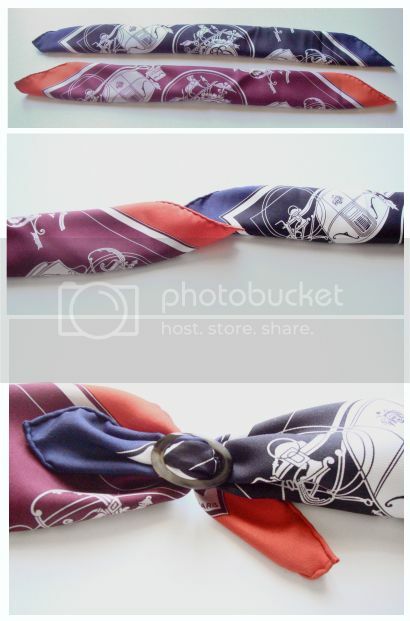 Suddenly you have so many more possibilities of combining your gavroches into different scarves! Thank you, dearest MaiTai, and thank you as well to gracekelly. 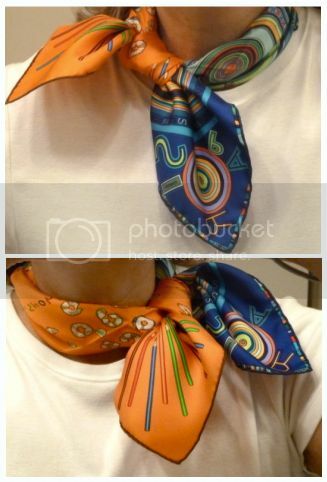 It is such fun to exchange different ways of tying our much cherished H´scarves. Hugs, M.
Wow! I would have have gone on only using my gavroches on my purses and summer hats, but this opens up a whole new venue for these lovely little treasures. Thank you Grace and MaiTai! MT, love the idea of the occasional guest author. Positively inspired! Dear Tereza, Scarf Addict, SEC, Manuela and Charlotte, many thanks for your kind comments, I am so pleased you enjoyed this post. Here's to gracekelly, and her generous and creative spirit! SEC, I have edited the post and included instructions at the end. Good luck! Dear Manuela, the exchanges here are truly inspiring to me. All guest posts, style challenges, comments or questions make this a lively and happy place, so a big thank you to you ladies! Thank you, dear Charlotte. I too enjoyed gk's post very much, and hope that it has paved the way for many more guest authors to come forward. Fantastic! I love collaborative efforts. Thank you so much to both gracekelly, for the great idea, and to our dear MaiTai for sharing and bringing it to us! Speaking of maximizing, the two gavroches together make a whole new scarf - particularly love the Crayons/TB combination. It is truly amazing how many ways one can fold and tie a square scarf, or two - possibilities are endless. I'm transfixed on your gorgeous JP's, dearest MaiTai. Love how you placed them too. Ms. Moka is absolutely stunning - one of the most delicious browns I've ever seen, and the older sister is positively glowing. What a fantastic idea, and it could be expanded to Twilly's too- one twilly never looks right around my neck, but two would to the trick and I love the idea of mixing the colors rather than matching 1:1, Thank you!! Wonderful idea gracekelly and MaiTai. Thank you both for sharing. How ingenious!! I especially like the first too combinations, and as Leslie mentioned this can be applied to twillys too!! Excellent! I could not agreee more, dear JA_UK, and between gk’s and Leslie’s ideas, we are having a lot of playtime lined up, hooray! Sorry I haven't commented lately, but I always seem to be short of time. However, I'm still following your posts with great interest and delight, dear MaiTai! And ditto on two twillies!!! So great to see you stopping by, dear dance! Hope you are happy and well. Happy you liked the post, have fun shopping for Gavroches (and Twillys!)! Dear MaiTai, only now did I read this post on the gavroches. Such a great idea to combine two gavroches! Recently, anticipating warmer weather, I started to get interested in other scarf formats like the gavroche and the 70 carre. 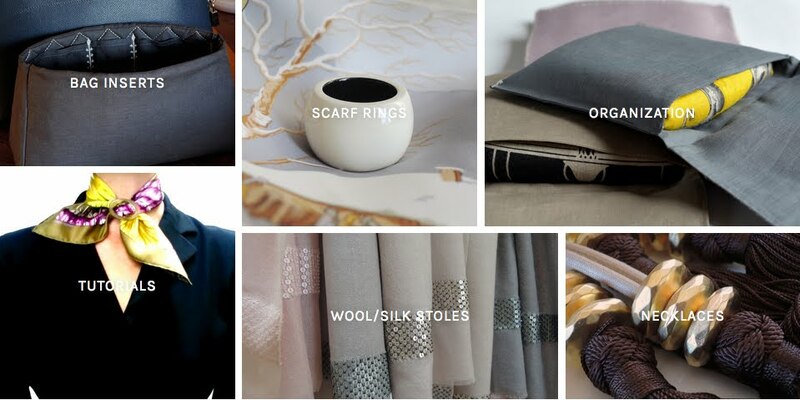 As always, your website and your scarf rings are such a wonderful source of inspiration. Thank you! Thank you, dear Cynthia! If you like the 70 format you might want to hurry, there are rumours that they'll be discontinued from next year on.